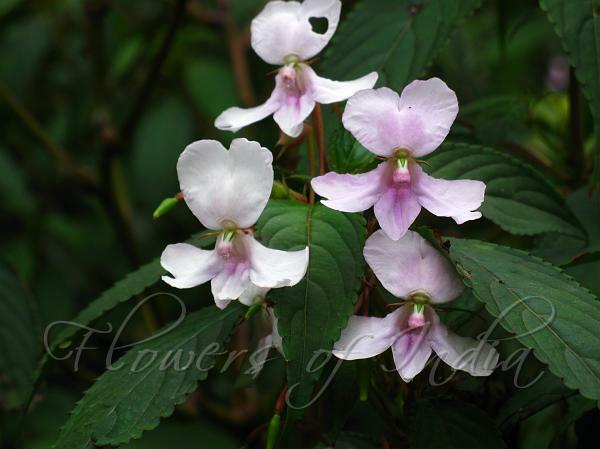 Synonyms: Impatiens latifolia sensu Hook F.
Spindle-Fruit Balsam is a shrub 50-100 cm tall, with stems and branches glaucous. Leaves are opposite, alternate or whorled, elliptic-lanceshaped, sawtoothed, 5-11 x 2-4.5 cm, glandular at lower margins; nerves hairy beneath; leaf-stalks 1.5-5 cm long, glandular. Flowers are borne in leaf-axils, singly or in fascicles, pale pink or white; flower-stalks up to 4-8 cm long. Lateral sepals are minute. Lip is funnel-shaped, cuspidate; with 1.5-2.5 cm long spur. Standard is about 1.6 x 0.8 cm, larger than wings. Wings are bilobed; basal lobes larger than distal ones. Capsules are ellipsoid, narrowed at both ends, about 2.2 x 1.2 cm; seeds 7-11. 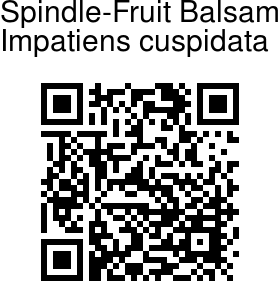 Spindle-Fruit Balsam is endemic to Southern Western Ghats, found between 1500-2000 m, in Karnataka,Tamil Nadu and Kerala. Flowering: August-December. Identification credit: Shrishail Kulloli, A.K. Sreekala Photographed in Munnar, Kerala.